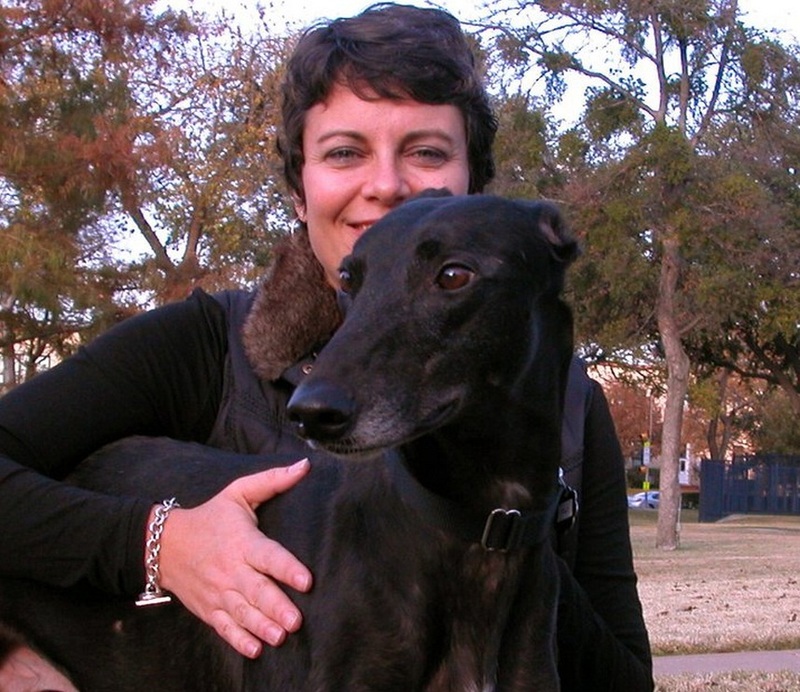 Last September we lost our beloved greyhound, Ancho, at age 13 under very sad circumstances. Overwhelming grief and the anxiety of my looming ovarian cancer 3 month checkup sent me to a very dark place. 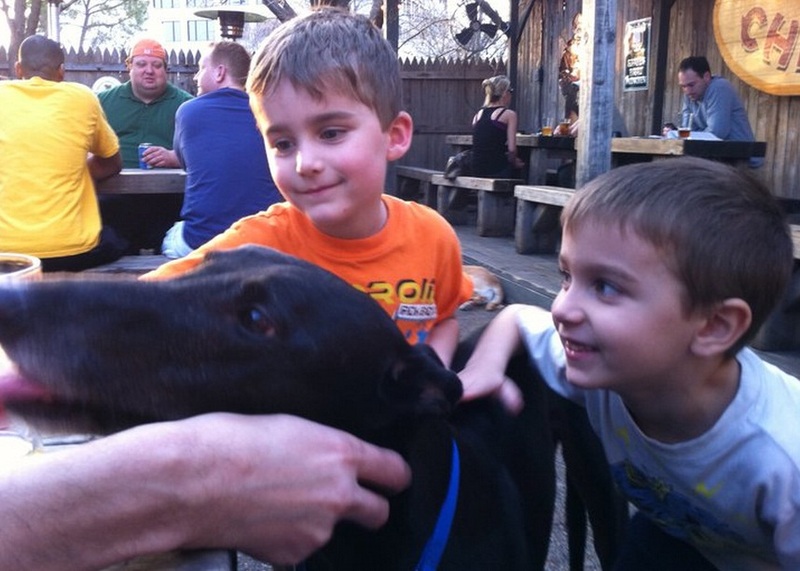 Fortunately October was Greyhound Awareness Month and it wasn't too hard to convince my husband, Mark, to attend the last stop of GALT's PupCrawl at Reno's Chop Shop. Over the summer I had found GALT on Facebook and followed the plight of the FWAC hounds, alternately crying and cheering them on. Max happened to be making his available for adoption debut that night and I was thrilled to see him. If you've had the pleasure of meeting Max, you know that he truly loves people. But that night, in a room full of admirers, he kept making his way over to us. I think he knew we were still heartbroken. When he ambled over and laid his head on Mark's knee I quietly told Mark about the horrors of the shed. He eyes softened, and he shook his head while tightening his grip on Max. And I knew. We went through the motions of "fostering" Max because we have two boys ages 6 and 4.5 and they are your typical loud and boisterous boys. It's a noisy house and we wanted to make sure Max was up to the challenge. On his second day with us he licked one of them napping on the couch and we knew. My oncologist stresses exercise to me and that's how Max became Diesel along with his gorgeous black coat. We go for 30-60 minute walks around the beautiful SMU campus and it's not until the last few minutes of our excursions that he slows down. The first couple of blocks he pulls me along, head down, ears pealed back and tail wagging, so incredibly happy to be out and about! Every weekday morning when he sees the boys with their uniforms on and school bags he glues his eyes and body to me. Watching, just waiting for his favorite word in the entire universe . . . "SCHOOL!" As soon as he hears it he explodes with happiness and races to the backdoor. He rides in the back of the SUV most mornings and many afternoons, my copilot and companion. He is happiest when we are all together whether it's at home, the Gingerman, Dream Caf�, or just riding around in the car. His joy and love of our family and his new life is my greatest therapy besides my boys. Upon hearing his story people often remarked how Diesel "hit the jackpot" but we know. We are the blessed ones.